Using the View Fields section in the bottom left of the Reports page, you can select to rank any numeric (or scored option data) using the show ranks button. You can also show the % change of the data and compare it to the most recent entry, or the first entry recorded for that athlete. Place a tick in the "Show ranks" tick box to include ranks of all numeric/scored variables that you select to view in the reports table. All of the numeric fields in the report will be ranked. 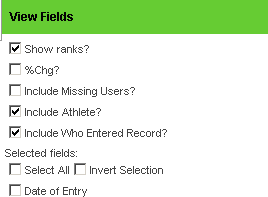 Click on the column headings to rank from best to worst for a field. 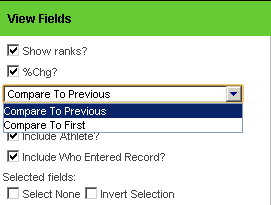 ONLY the fields that have had their advanced properties set as higher better than lower, or vice versa, and a best value added for the options, will have a rank. If that data is not ranking correctly then you need to contact your Site administrator/builder and ask them to update this for you. You can see here that Sleep Quality and Stress haven't been ranked because their advanced properties have not been set up. For the Percentage change calculation, you can select to see the percentage change from the previously entered record or the first record ever enetered. -Compare to Previous will compare the data to the most recently entered data for that athlete and calculate the %change from that. 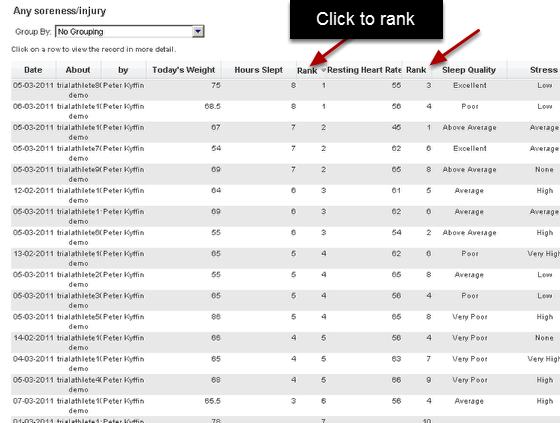 Choose your desired comparison and click run report again. You can see that there are large differences in the Trial athlete 1 demo with 20% change in weight.